Welcome to week one of Preserving the Harvest which will be a twelve week series on preserving fruits, vegetables and herbs to use throughout the year. My goals isn’t to teach you everything you need to know about every preservation method or every fruit or vegetable. My goal is to encourage you to not see preserving food as some big overwhelming thing and to try something new. Since we garden year round, I don’t feel a need to have 50 quarts of green beans in my pantry. But I do like a few for when we want to make shepherd’s pie. But I also like frozen green beans for adding into soups. And we just discovered that we really like dehydrated green beans and lacto-fermented green beans for snacking on. So let’s start with preserving green beans. Shall we? I have a set of worksheets I print each year to keep track of what I’ve preserved. You can get the worksheets emailed to you by filling out the form below. 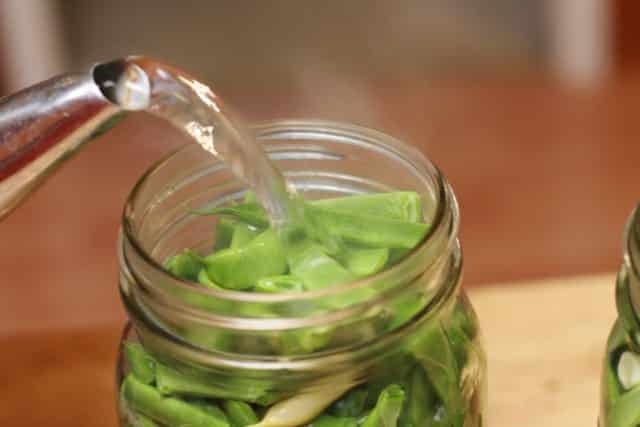 This is the easiest way to preserve green beans for long term storage. Just wash, cut, put in a ziplock bag and put in the freezer. Yeah, I don’t blanch my green beans (or other things I’ve been told I’m supposed to blanch). I’ve done it both ways and honestly, I don’t think blaching makes the texture any better. So, I don’t do it. 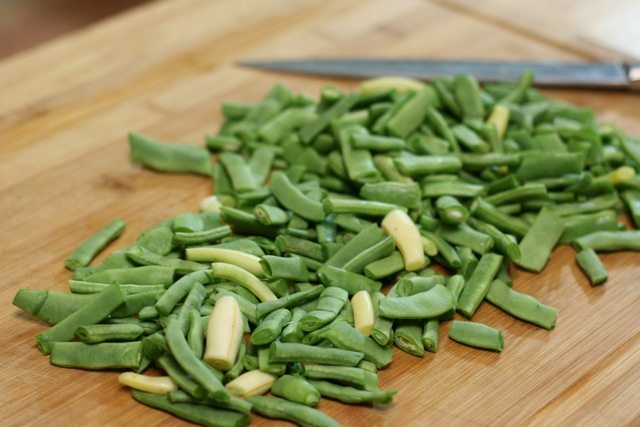 If you grow your green beans organically, there may not even be a reason to wash them. We grow a mix of bush beans and pole beans so I usually wash them. Make sure you dry them before freezing. Cut them into whatever size you like. Put them in a ziplock bag and remove as much air as possible. A drinking straw comes in handy for this. Label and freeze. 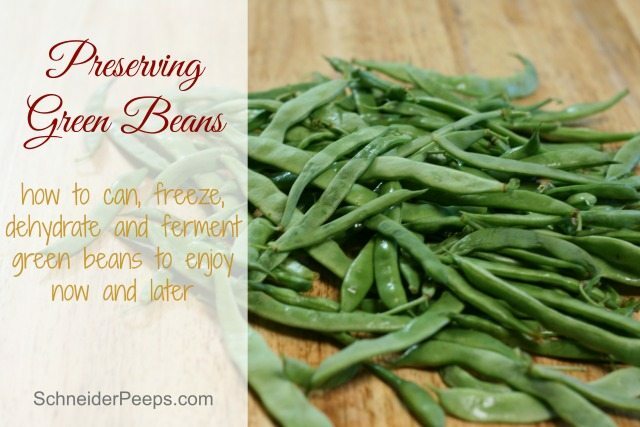 Freezing green beans is great for when you just have a small amount to preserve. You don’t have to have a full bag to freeze and you can add to the bag whenever you need to. When I started to write this, I got a little nervous about sharing something that we do that is totally against what most people do. So I googled it. And guess what? My friend Jami from An Oregon Cottage doesn’t blanch her green beans either. She even made a cool video about it. Don’t worry I’m not going to give you any rouge canning ideas for green beans. Green beans MUST be pressure canned. They do not have enough acid in them and unless you are going to pickle them you probably are not going to add enough acid to safely can them in a water bath. Wash, snap and destring your beans. Boil some water – a large tea kettle is awesome for this. 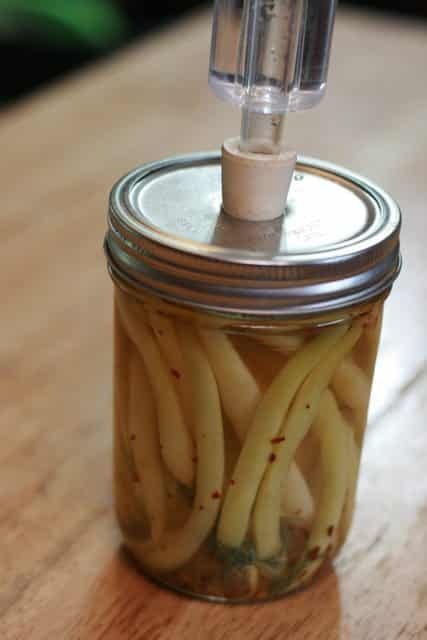 Since you are using a pressure canner you can raw pack them into your jars. Make sure your jars are clean. They don’t need to be sterilized but you can do that if you want to. Pack the green beans into your jars. Add a half teaspoon of salt to each pint and a teaspoon of salt to each quart. If you don’t want to use salt, then don’t, but I think beans really need salt. Pour the boiling water into each jar leaving a 1 inch head space. Run a spatula or bubble remover around the inside of the jar. This will release trapped air. Do it a few times and if you need to add more water, then add a bit more water. But remember to leave a 1 inch head space. Now, it’s time go get your instruction book that came with your pressure canner out and check the pressure and time you need to process the green beans. Some of this depends on your altitutude so I’m not going to give those instructions here. If you no longer have your book, Sharon from Simply Canning has a great post with detailed instructions you can use. If you are nervous about using a pressure canner, At Home Canning for Beginner’s and Beyond dvd is a wonderful resource. Use promo code LEARN2CAN to get a $5 discount. This is something new I’m doing this year. I’ve been trying out different fermenting recipes trying to get my family to eat a few more probiotics. For a family that, for the most part. does not like pickles this is no small feat. But I saw a recipe for spicy pickled snap peas and thought I should try some green beans. Actually I tried wax beans but we call them “yellow green beans”, so it’s the same thing, right? We’ve made several batches and they are really good. Carl is even eating them and he HATES pickles. I wrote the whole recipe out for the Fermentools blog but I’ll share the basics here. Wash the green beans and snap the end off. Pack them into a clean wide mouth canning jar. Add any spices like dill, garlic or rosemary. It helps to put the jar on it’s side for this part. Make a 2% brine solution and pour into the jar, covering the beans. Put a weight on top. Put the airlock system on your jar and store in a cool, dark place for a week or so. After a week remove airlock system and weight. Put a regular lid on the jar and store in the refrigerator. We are really liking dried green beans as a snack. Now, I’m the first to admit that my kids are not eating them in the same quantity that they would a bag of chips. But these have a nice crunch to them and a nice flavor. Since we’re just using whatever we happen to pick that day, this is more of a process than a recipe. Pick and wash your green beans. If you grow pole beans and want to skip the washing, that’s fine, I won’t tell. Snap the end off and destring if your beans have strings. You will need to blanch the beans. So boil some water and drop them in it for 2 minutes. While they are in the boiling water, fill a large bowl with ice water. Using tongs or a slotted spoon scoop the beans out of the boiling water and put them into the ice water. Let them cool. Take the beans out of the ice water and pat dry. Lightly coat with coconut oil and sprinkle with Parmesan cheese. 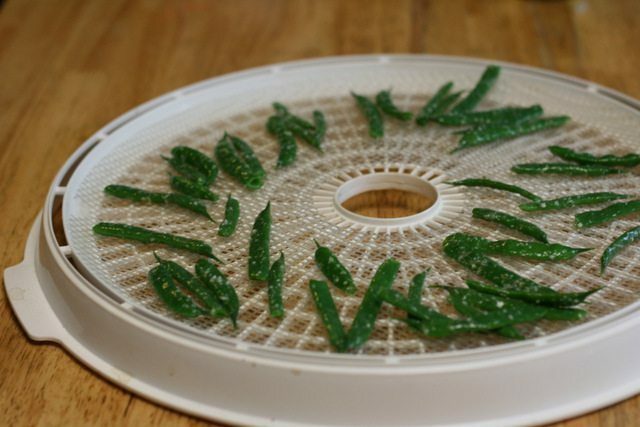 Put on dehydrating racks and dehydrate for 5-6 hours or until crisp. Store in a jar. I don’t know how long they will last because my kids are eating them that day. But if they didn’t eat it in a few days, I would probably store them in the refrigerator. It’s just what I do. Be sure and enter the giveaways for the freezer labels and the canning dvd. So that’s it, folks. 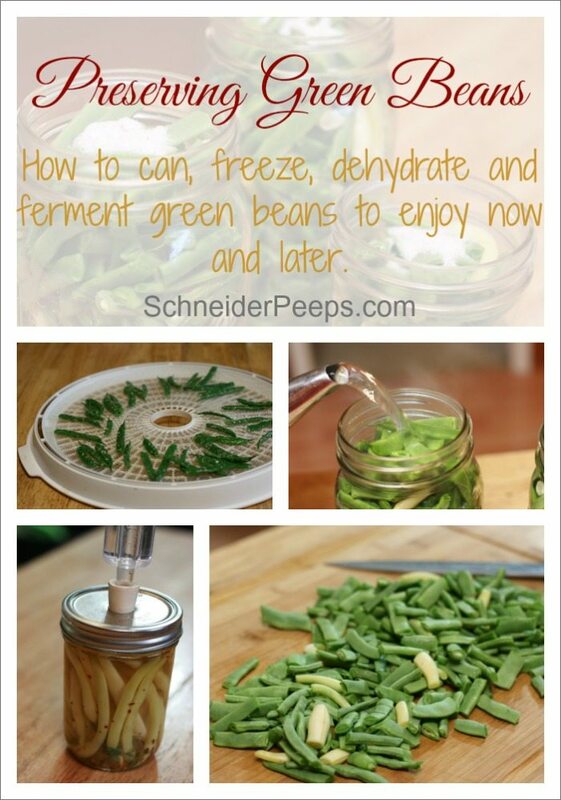 Four different ways of preserving green bean. Do have any other ideas on preserving green beans? If so share them and any questions in the comments. I just smiled when I saw your posts come up in the search. I will definitely have to try the dehydrated beans. Sounds yummy!